After visiting a museum, have you ever thought about what you remembered the most? What made the biggest impression on your senses and emotions? 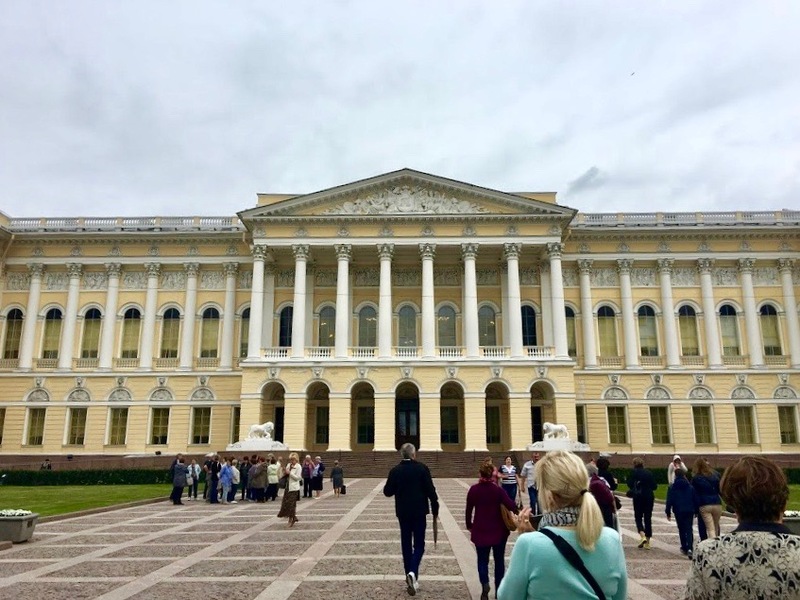 During my last trip to St Petersburg, Russia, I visited numerous art museums and galleries to try and gain a better understanding of Russian culture through its art history. Here is a small "vignette" of what I experienced at one of the the city's most famous museums. St Petersburg's State Russian Museum is a must do activity for art lovers. The State Russian Museum houses an art collection of over 400,000 pieces and covers the entire history of Russian fine art. The museum is primarily housed in the Mikhailovsky Palace, a Russian masterpiece of Neoclassical architecture and interior design. Organized chronologically, this visitor-friendly layout facilitates the understanding of Russian art evolution. It starts with Byzantine period which showcases Orthodox church icons then continues through more classical paintings influenced by Western European and ends with twentieth century avant-garde work. This strategic design ensures that visitors leave with a complete overview of what Russian art is all about. Before the reign of Peter the Great, the depiction of the human face in artworks was only allowed in Russian icon painting. One of Peter the Great’s main goals was to modernize Russia and integrate it into the civilized, European world. He commissioned Italian architects and artists to transform St. Petersburg into a modern, cultured city. During this time, the subjects of Russian paintings became more diverse with portraiture being most in vogue. According to Wikipedia, "Masks of deceased persons are a part of traditions in many countries." One of the most famous and earliest masks was that of King Tutankahmun, an ancient Egyptian pharaoh. His mask was made of gold and gems, and its purpose was to protect him from evil spirits during his journey to the afterlife. The Romans' funerary masks were made of wax and were not buried with the dead. Instead, they served as the basis for many stone sculptures. While they were used in funeral ceremonies, they were later kept on display in libraries, museums or universities. 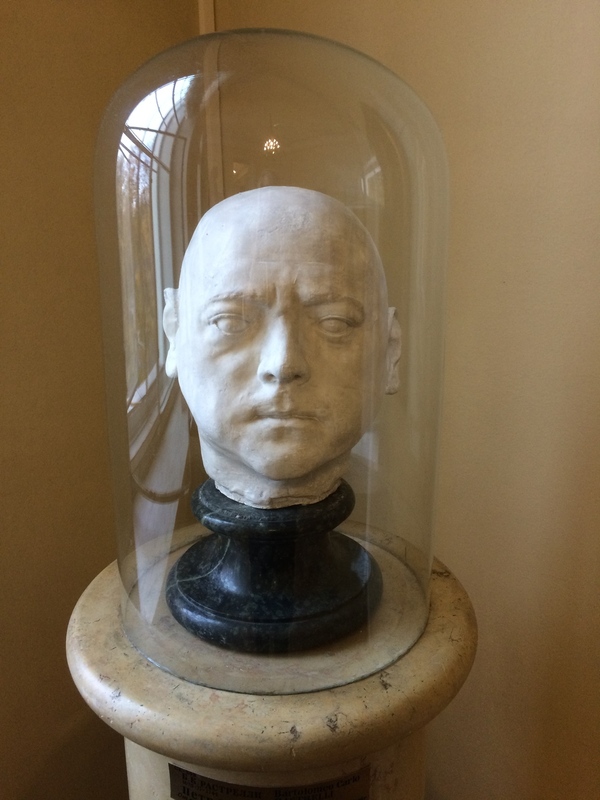 During the Enlightenment period of the 18th century, death masks were made for royalty, nobility and other prominent people such as poets, philosophers and composers. Russia's mask tradition dates back to Peter the Great. An Italian architect, artist and sculptor, Carlo Bartolomeo Rastrelli, created the first life and death masks of Peter and thus, started this tradition in Russia. Rastelli transformed the simple death mask into an art form. Lenin, Trotsky, Pushkin, Tolstoy, Ana Pavlova, Brezhnev and Boris Yelsin have all had masks created for cultural posterity. A mask of a person, made in life or after death, is said to capture the essence of the person. I have seen several statues and paintings of Peter the Great, but none of them caught my attention or made a lasting impression of the man as did his life mask. His face was strong, refined and intelligent, nothing like some of the haughty European rulers I had seen in other museums. Peter the Great was a remarkably, tall and handsome man who possessed a "heroic spirit." He was said to have had "indestructible energy," an "iron will," and a "fearless gaze." In addition, he loved masked balls, parties and dressing well. Seeing this "life mask" for the first time left a memorable impression on me. Alexander the Great’s greatness really shown through his mask. I never expected to be so moved by such an art piece. However, art is intended to illicit emotion from the viewer, and you never know what will speak to you. This is why visiting museums is one of my favorite things to do in a foreign country. It helps you get to know the culture, and gain insight into a part of history you might not have been aware of before. To check flight availability St. Petersburg, click here to check on Expedia.com.